I was recently reading up about buying and selling domain names. There is a massive community that invests in this space and many articles have been written about how to do it well. The more research I did, I realized that it is remarkably similar to venture capital / growth equity. They invest in various early stages of an asset in which they have expertise, hold on and develop it over time, then flip it, but most fail. And as the asset appreciates, the risk declines similar to a Series A, B, C, and so on. 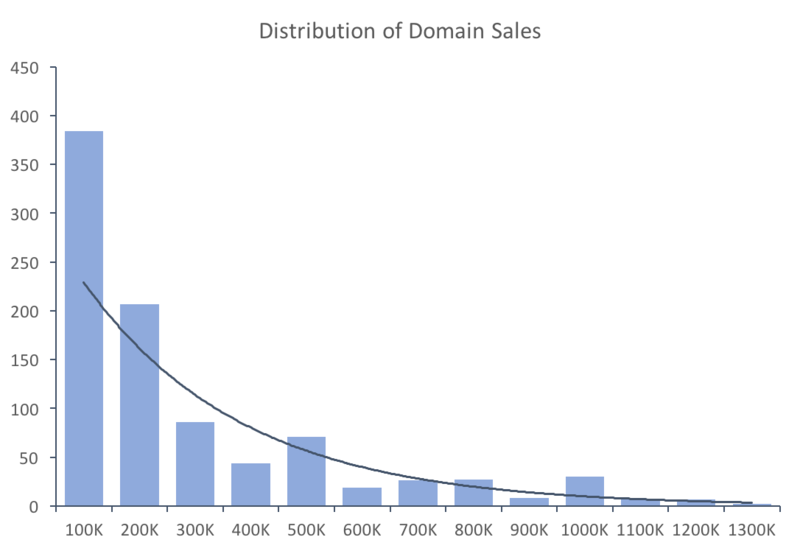 To further illustrate, the top domain sales also follow a power law just like VC / GE portfolios. Why is this important? We can use these similarities to pull out investing guidelines. For example, the best in the field write about not investing in youvideo.com because youtube.com is worth so much. It is important to mimic success correctly. So investing in an etherium, machine-learning, marketplace, on-demand startup is probably a horrible idea. They are just mimicking every trend for no real purpose. Find a reason for a domain to be valuable. So if you know there are 200 startups / year that are working on blockchain, consider buying up 50 - 100 domains that have relevance to the field. It will be tricky because tech companies always have the strangest names but you get the idea. Many people often make the mistake of investing in a domain name and then refusing to sell if for less than $500,000. It may be worth a lot but probably something far less. They may say, “somebody may be willing to buy it, and then I would be rich!” This needle in the haystack mentality is key to venture, but you have to weigh the odds. If there is a one-in-a-million chance of success, you are buying a lottery ticket. At the very least, at least make sure your economics match that of a lottery ticket. If they are worse, you probably should not invest. But also, ask yourself if that is the level of risk you want to take. At the end of the day, I find drawing comparisons helpful in reinforcing and learning new ways to think about investing. It makes it concrete and especially in topics like this, there is enough content to really understand what the mass of players think.